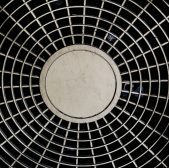 Chances are, you know when someone needs to come out and look at your HVAC system. It's making strange sounds or it's not cooling or heating properly. You probably also know when your fleet vehicles need servicing. And, you know to call a plumber if your toilets keep overflowing. But do you know the signs that your walk-in cooler needs repair? If you've noticed any of the following, it's time to call someone in to take a look ASAP. There are more than 660,000 restaurants in the U.S. and just about all of them have a walk-in cooler. That's because a walk-in cooler is vital to the restaurant industry. A walk-in cooler or walk-in freezer is an enclosed storage space kept at or below 32 degrees Fahrenheit. It's less than 3,000 square feet and -- as the name suggests -- you can walk into it. The federal government has several codes and regulations that manufacturers and restaurants must meet. Not being in compliance can lead to fines. Local health departments also have the authority to shut restaurants down until they meet the code requirements. This ensures the food held in the cooler or freezer is safe for consumption. That's why it's of the utmost importance if you notice that your walk-in is "acting funny." But, what does this mean? If you notice any of the seven signs below, call a licensed refrigeration repair company. If there's wear or damage to your walk-in door, you're paying a steep price. You're paying more to have the temperature stay at a consistent temperature as cool air leaks out. You're also risking that the food inside will spoil. Check the seal of your door every day. Make sure the seal looks undamaged and you can't feel cool air leaking out. If you do notice either of these, call a repairman. If the door itself won't close all the way or gets stuck, you should also call someone out to take a look. While it may be a minor issue, you don't want it becoming a major one. If the food inside your walk-in has freezer burn, you may need to retrain your kitchen staff how to properly prepare food for storage. But, if you have frost built-up on your walls or door, you may have a bigger issue. Frost forms when warmer air comes into contact with cooler air. So if you see frost building up where it shouldn't, it's a sign your walk-in isn't working correctly. If you see puddles or wet floors, it's more than a nuisance -- it can cost you a lot of money in the long run. This could lead to mold or mildew. It's also a safety issue as an employee could slip and fall. This will cost you big time if a health inspector sees it or you end up with a worker's comp claim. There may be something wrong with your door seal or it could be a refrigeration issue. Either way, call someone in immediately to troubleshoot why you have wet floors. Wet floors aren't the only sign that something is wrong. If you see water leaking from the ceiling or condensation on your walls, you may have something wrong with your walk-in. It's also possible this issue is the result of an HVAC or plumbing issue. The good news is, there are reputable companies that provide services for both! Have you ever opened your walk-in in the morning only to get hit with a horrible smell? It's like you're under attack by a wave of rancid food or an odd chemical odor. This is definitely a major indicator that something's wrong. It could be a line leak or it could be the temperature is too low and the food is now starting to spoil. If it's a coolant leak, it won't necessarily smell like bad food. Instead, it will smell like a cleaning chemical or gas. In the morning, before your kitchen staff begins prepping and cooking, open the walk-in door and give it a good whiff. If you smell anything odd, call a repairman before the problem escalates. You've likely noticed that your commercial walk-in relies on a motor that usually hums. But if that hums becomes loud or you hear a knocking or squealing, this is a sign could be something wrong. Or, it's a warning that something's about to go wrong. If the motor stops, you might as well lock your doors. In other words, you have no means of keeping your food refrigerated and it's a very pricey fix. Don't let it get to that point. Call a repair service as soon as you hear a strange sound coming from the walk-in. Another sign something is off is if the cooler lights flicker. This could be a simple issue or a warning that something's not quite right. Finally, if the area near the motor feels unusually hot, you have an issue. This can become worse and affect the overall temperature of your walk-in, so get it handled ASAP. So, what's the big deal? Like we mentioned earlier, proper refrigeration helps ensure the safety of the food stored inside. How? Refrigeration slows bacterial growth. This bacteria grows and multiplies the fastest between 40-140 degrees Fahrenheit. The USDA warns that some bacteria can double in as little as 20 minutes. This bacteriaÂ can make people very ill. The safest temperature to keep food stored is below 40 degrees Fahrenheit. If your walk-in cooler isn't staying at a consistent temperature below this, the safety of the food is at risk. If you or an employee notice temperature fluctuations, act fast. Check the walk-in's thermostat to ensure it wasn't set higher on accident. If the temperature is set below 40, call a technician in to check the cooler. It could be something simple like the calibration needs adjustment. But, it could also be a sign it needs coolant or there's a leak. If you're a restaurateur, the last thing you want is to get any of your patrons sick. You also don't want a fine -- or worse -- the health department forcing you to close your doors. 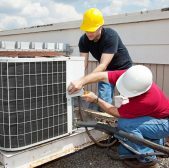 That's why it's imperative that if you notice any of the seven above signs, you call a walk-in cooler repair service. At McNamara Custom Services, we've been in business since 1982. 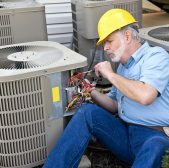 We proudly serve the Waco area by providing 24-hour service for refrigeration, AC, plumbing, and mechanical repair. Contact us today and allow one of our well-trained staff members to assist you with your facility's needs.